An epidemic of vandalism against monuments to Lenin appears to be spreading from Russia to Ukraine, where a Soviet era statue has been blown up. According to the Lugansk Regional Office of Ukraine’s Ministry of Internal Affairs, vandals have blown up a Lenin statue in the city of Rubezhnoye. According to people living in the area, the blast was very strong. The statue is still standing but is damaged: a piece about thirty centimetres wide has been torn out from the back. The hollow statue is almost three metres tall adn made of a copper-brass alloy. The local police office were notified of the incident on April 3, said Tatyana Pogukay, head of the Ministry’s regional public relations office. A group of forensic experts was immediately dispatched to the scene. Tatyana Pogukay added that the statue was owned by the local authority and was due to be taken down. 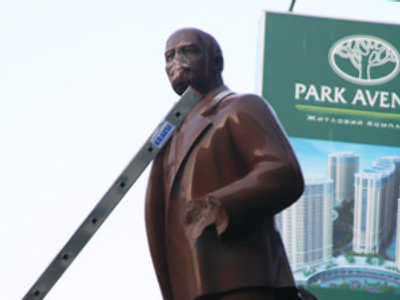 At the same time, the local communist leader and a member of the municipal council, Nelli Zadiraka, said the statue is officially registered, and the question of its dismantling has never arisen. 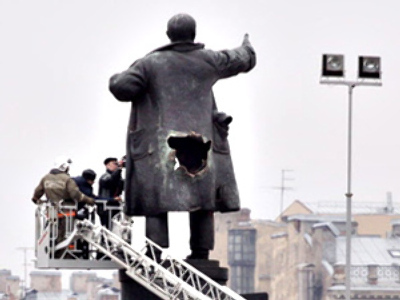 The Ukraine’s explosion follows a similar incident in St. Petersburg in Russia two days earlier, and another one in the south of Russia, when a stone image of Lenin was defaced by vandals. 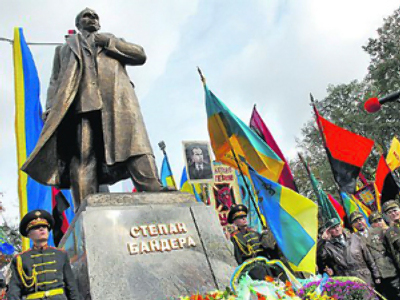 Bandera: Ukraine’s national hero or traitor?